Spring is here—the perfect time to pick up some freshly-grown raspberries. We wanted to create a light and healthy breakfast using this deliciously tart fruit, and came up with a recipe that will surely put the spring in your Spring. 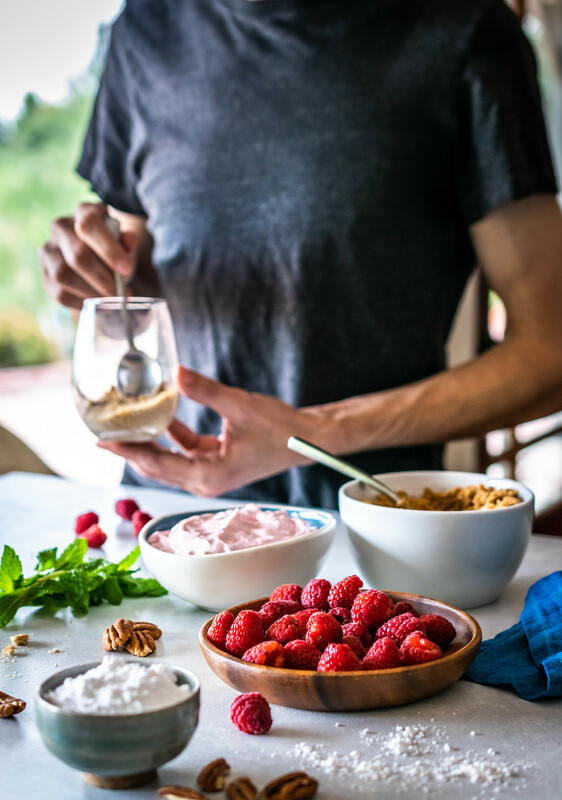 Made with smooth greek yogurt blended with raspberries, vanilla, and lightly sweetened with powdered sugar, these pretty parfaits may look like dessert, but they are filled with protein and vitamins, making it a tasty way to start your morning. 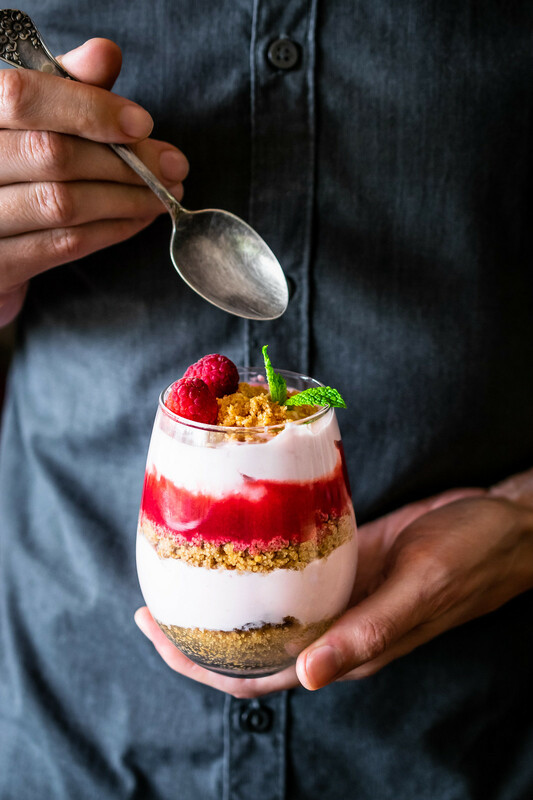 Layered with a toasted pecan and graham cracker crumble, swirled with a striking red raspberry puree, then topped with fresh berries, your family may just shed tears of joy when you waltz into the dining room this weekend with these gorgeous cups in hand. Tune into our weekly Instagram show today at 12pm PST as we prepare these pretty pink parfaits live from our cozy house on the hill in Eagle Rock, California—and if you aren’t able to catch the show today, subscribe to our YouTube so you never miss an episode. See you soon! Place the pecans in a small dry skillet, and set over medium heat. Cook, stirring occasionally, until the nuts are fragrant and toasted, 5 to 7 minutes. Transfer to a plate and place in the freezer to cool for 5 minutes. When cool, place the nuts in a food processor, then add the graham crackers and pulse until coarsely ground. Add the coconut oil and salt, and pulse briefly to combine. Transfer the sandy crumb mixture to a bowl, then wipe out the food processor. Place the raspberries in the food processor, and blend until puréed. Pour the purée through a fine-mesh strainer set over a measuring cup and use a silicone spatula to press the mixture through, leaving the seeds behind. In a small bowl, stir together the yogurt, powdered sugar, vanilla, and 3 tablespoons of the seedless raspberry purée. Spread a layer of pecan crumble at the bottom of a cup or dessert glass. Top with about 1/4 of the yogurt, spreading it into an even layer. Top with another layer of pecan crumble, then spoon a layer of raspberry purée over the crumble. 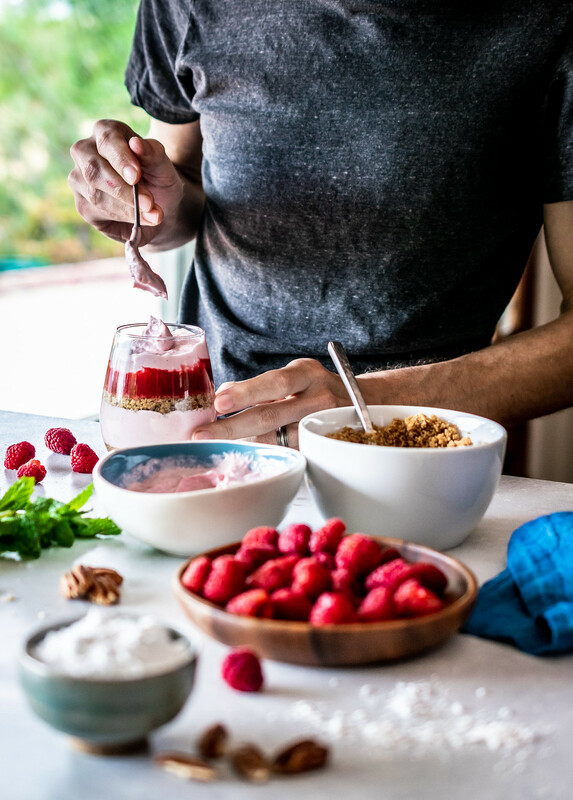 Top with another 1/4 of the yogurt, then sprinkle more crumble on top, and garnish with mint leaves and fresh raspberries. Repeat with a second cup, then serve, and enjoy! 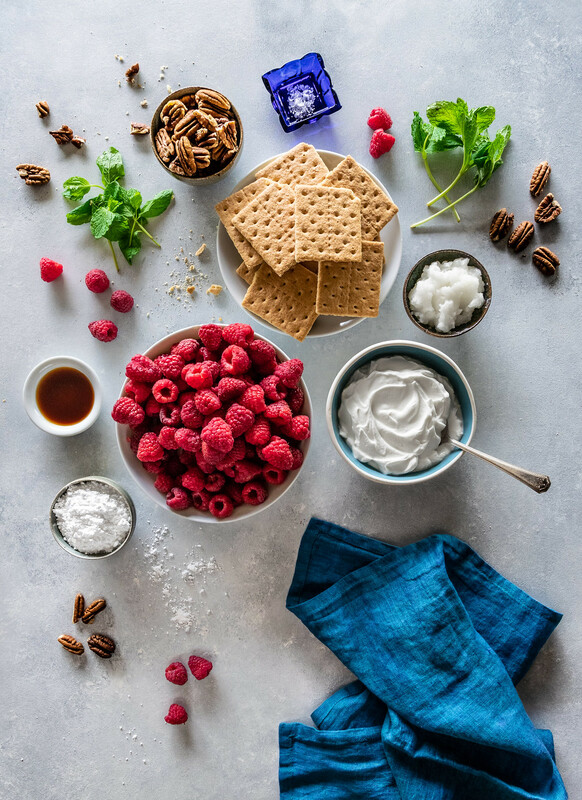 — The pecan crumble, raspberry purée, and raspberry yogurt can all be made separately ahead of time, and assembled when ready to serve. I think I’ll make this for breakfast up at the family cabin next weekend when everyone is there to open up for the year! Sounds so delicious. I’ll be using my favorite Lactose Free yogurt for Ryan’s sake. Great pictures! Have a nice weekend, Ryan and Adam. Beautiful parfaits, I love the perfect layers! Thanks so much Laura! We had them for breakfast again today! So tasty! Ouuu my kids would be nuts about these! Can’t wait to try them. Thank you so much! We hope they (and you!) love them as much as we do!